This Long Lines site is situated about three miles east of Holden, MO on Highway 58 – or half-way between Centerview and Holden. This station served as telephone-only relay station, according to the 1960 Long Lines microwave route map. The station hops to the Aullville station to the northeast (which is right along I-70) and to Dayton to the southwest, which only carried telephone signals. Between 1960 and 1966, more connections were added to the Holden tower: a hop to the northwest to Oak Grove, and another hop to the southwest to Windsor. The Oak Grove-Holden-Windsor line included both television and telephone signals, according to the 1966 Long Lines microwave map for the central section. 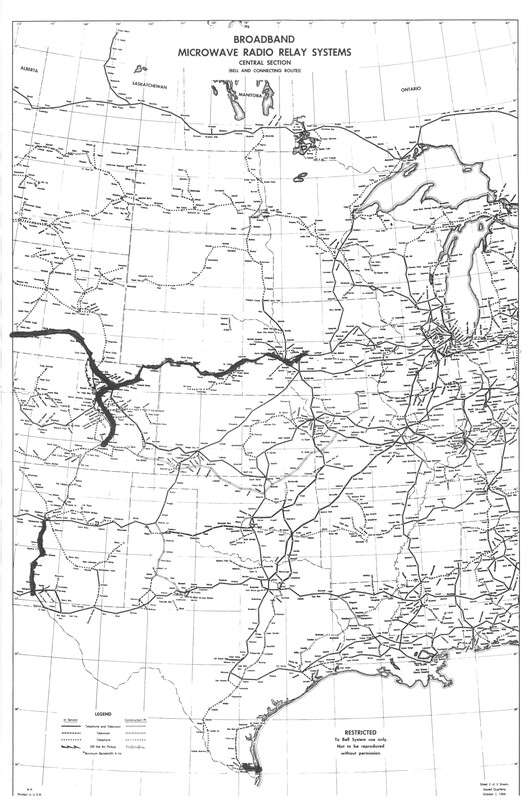 The 1966 map states that the Aullville-Holden-Dayton line was still only telephone. Today the site has been abandoned by AT&T. The horns have been removed at some point since 2008, when a Google Street View image still shows the tower having its KS-1576 horns. The site neighbors a water treatment facility. While the site has been abandoned by AT&T, it appears that a mast was erected on the top-most platform, possibly serving as a tower for a CB or ham radio site. The base building is large; much larger and of a different design than the base stations at the Prairie Home and Slater sites. The tower is assumed to have been hardened for additional nuclear detonation protection, as evidenced by the “blast shield” for the outdoor air vents on the side of the base station. Many Long Lines sites were “hardened” or even built underground for maximum protection against a possible nuclear detonation – which was a concern for AT&T during the height of the Cold War. As further evidence, this building has no windows – and only one door. On the left side of the building is a “blast shield”, which would protect the outdoor air vent behind it from being damaged by flying debris or fallout in case of a nuclear detonation. Unlike the Slater and Prairie Home base buildings, this building has no windows. A picture showing the horn platforms on the tower. There would have originally been four horns per platform, one on each corner of the bottom platform, and four on each side of the top. Note the mast that was built on top of the top-most platform. Pictures taken February 25, 2018 by me using the Samsung Galaxy Express Prime 2.